Mauna Lea (Berg Joy) Manor ist ein 5 Private-Morgen-Zustand in der Kona Coffee Land an den Hängen des Hualalai Vulkan, mit Blick auf die kleine Küstenstadt von Kailua-Kona versteckt. Auf diesem Grundstück befinden sich 4 Hütten zur Verfügung Miete. Jedes Haus ist eine Ein-Zimmer-Studio mit ausgebautem Dachgeschoss und ein Badezimmer. Auf dem Grundstück gibt es einen Tanz / Yoga-Studio Sie Klassen verwenden oder teilnehmen können (privat / Gruppe). Wir haben auch ein Fischer / Schnorchel Boot der Kahele für Charter genannt. Unsere Familie wohnt auf dem Grundstück in das Herrenhaus. Wir haben drei Jungen, die mit anderen Kindern zu spielen lieben. Mein Mann ist ein Fischer / Zement-Maurer und ich bin ein lokaler Künstler, und ich auch Kunst und Tanz unterrichten. Wenn Sie gern tanzen, ich bin glücklich, Ihnen mit den netten Orten zu verbinden zu gehen und die interessanten Menschen in unserem lokalen Tanzgemeinschaft (Tango, zouk, Salsa, Bachata, Bauchtanz, Gesellschafts, etc.) gerecht zu werden. Da wir beide auf der Insel aufgewachsen ist, freuen wir uns, die besten Plätze mit unseren Gästen zu teilen, um zu finden, und wenn, sind wir glücklich, Sie planen, eine unvergessliche Reise zu helfen. 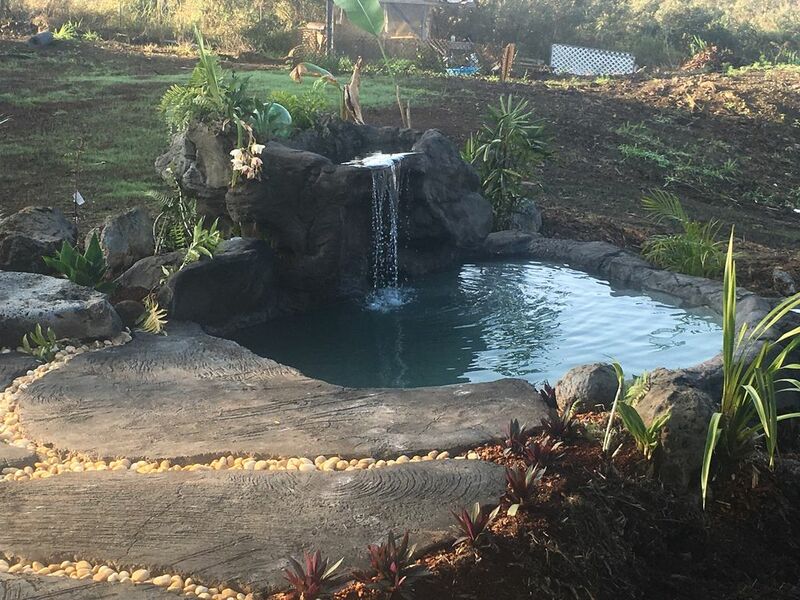 We enjoyed our stay in the charming oasis away from the bustle of Kailua Town while staying to watch the Ironman. I close 15 minute drive, the tiny house was a perfect size for 2 adults and two kids. Our girls loved the loft and the hot tub/waterfall pond. The nature sounds at night were loud at first but part of the charm. The hosts were responsive and full of knowledge. Would stay again! We are so thrilled that your family enjoyed your stay & hope to see you again in the future! What a lovely place to start our Big Island Adventure! Very comfortable and wonderful vibe! Loved the funky cottages. My husband and I were in separate loft and my kids loved the bunk beds. It had everything we needed. The big bonus: the tree frogs at night were amazing! We thoroughly enjoyed our 10 day stay in the green cottage. My teenagers loved the bunk beds and my wife and I enjoyed the loft. Being city kids my daughters were surprised with how early the neighbor's cows and roosters started making noise but it wasn't annoying. The location looked farther out of town on the map than it actually was. We were only a few minutes from the main road through Kona. My only negative comment is about the speed bumps that the neighbors put in the access road. It is a good thing that the rental companies don't check for scratches under the car because we scraped bottom on three of the speed bumps any time we had more than three adults in the car. Even when traveling at 2 mph the full sized sedan still scraped the bottom. Bottom Line: Nice place for a reasonable price! Thank you Stephanie. Good getaway from Kona bustle. Stayed here above Kona for 6 nights and it was a pretty solid getaway. Cottage had most of what one would need. Couple caveats to be aware of - the place is between 6 & 7 miles from what Kona has to over, straight upslope. I found the distance and traffic-choked drive a little inconvenient but like I said, I was here for almost a week and a sky full of stars we couldn't have seen in Kona counterbalanced the location. Also- know that it is not that quiet. Not only are the 4 cottages closely spaced together so u can hear folks next door but the immediate neighbor down slope has a rooster and barking dog. Not always vocal but they're there. Also, the dance studio is in use so folks do come and go. It's not too obtrusive but the place is a home and business for the owners. I recommend trying to rent the red or yellow cottage- not only are they further from the driveway but they have nice little lanais. The cottages are cool and nicely done for sure. Our property is rural and has uneven terrain, wildlife, and may require the use of vertical ladders, so we have a liability waiver that guests must sign at check in, stating that they understand that they are responsible for their own safety in order to be our guests.